Free download StrokesPlus latest version. 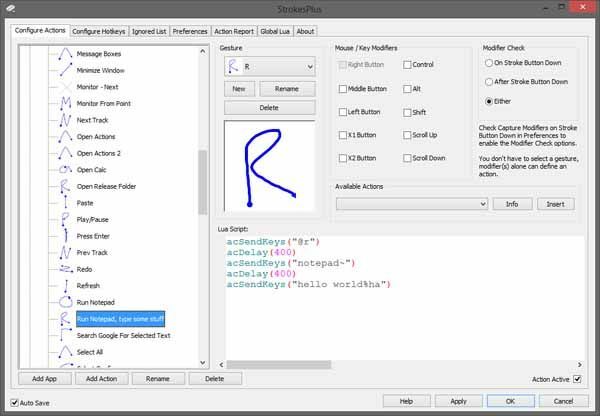 StrokesPlus is a completely free mouse gesture recognition utility for Windows which allows you to create powerful mouse gestures that save you time. With rocker support, modifiers, and the robust Lua engine built right in, there’s virtually no limit to what you can automate. Whether it’s a faster route to work, pressing 0 to talk to a human being instead of listening to an automated menu, or your favorite Internet browser pinned to the Windows taskbar. Traditionally, you begin a mouse gesture by holding down the right mouse button and drawing something, like the letter R for example, then release the right mouse button. This triggers the application to process your drawing and perform the specified action. The most common actions are maximizing/minimizing windows, navigating back/forward, or automated logging into a certain website. However, StrokesPlus takes it to the next level, giving you ultimate control over exactly what happens when your action executes.